Have you been told you that your monsoon water pump is not repairable and you may need to buy a new water pump? The cost of a new monsoon or Stuart Turner pump is around €750 and to get it installed and the installation cost could be anywhere between of €110 & €150. If you are lucky enough to have good water pressure you will not need a booster pump but some homes and businesses have very little pressure and this is where a water pump will give you the pressure you need. In our opinion the best water pumps on the market today is the Stuart Turner Monsoon range. Stuart Turner manufacture these pumps in Henley-on-Thames in the UK and they are distributed all over the UK and Ireland. These pumps will stand the test of time if installed correctly and installed in the correct environment. You get what you pay for and the Stuart Turner pumps are not cheap but you will definitely get your moneys worth. There is no reason why you should not get seven or eight years without needing a repair on the pump but normally around this time your pump will either need a mechanical or electrical repair. If you need to replace your water pump we recommend replacing your pump with a Stuart Turner Monsoon Negative head 2 bar pump if you already have a negative pump installed. Another good option would be a Grundfos pump which are very robust pumps. We would only recommend replacing your water pump if its beyond economical repair. We can either replace your pump or carry out a full repair service. Same day on site repair in your home. Is your Stuart Turner monsoon pump leaking making a strange humming noise why contact us today. We offer you a No Fix No Fee which means if we cannot repair your pump we do not charge you. Or you can drop your pump up to our call in centre in ballymount in Dublin 24 where we can fix your pump while you wait, repairs are normally done in less than 40 minutes. Stuart Turner Monsoon 1.5 bar positive and negative head pumps. Stuart Turner Monsoon 2.0 bar positive and negative head twin pumps. Stuart Turner Monsoon 3.0 bar positive and negative head twin pumps. The Stuart Turner Monsoon water pump range are mainly used to pump and boost cold and hot water in houses and apartments or can be used as a shower booster pump on one system like a rain head shower unit and a stand shower head. 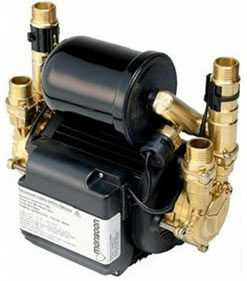 Stuart Turner Monsoon are high quality brass twin domestic shower pumps and whole house water pressure boosting pumps. They are designed to meet the demands of a modern property where a boost of water is required to power showers, bathrooms or the entire property.